The third-year UCLA School of Dentistry student grew up listening to and admiring several of his cousins who are dentists as they explained what dentistry was like and how it could be a fulfilling career path. These family influences combined with an internship in 2013 at the American Dental Association’s offices in Washington D.C. guided him to want to become more than a dentist but also an advocate who fights for issues that affect the profession. This past March, Hamedi-Sangsari’s passion for the dental field was recognized by the American Association for Dental Research when he was selected as the first recipient of the association’s Student Advocate of the Year Award. This award was created to recognize a dental student for his or her outstanding contributions in advocacy for oral health research. Hamedia-Sangsari’s interest in dental advocacy began while he was a student intern at the American Dental Association (ADA). His primary duties were to assist the ADA’s grassroots efforts: this entailed reaching out to dentists as potential new members and accompanying lobbyists to Capitol Hill to support candidates who were proponents for the profession. During his internship, Hamedi-Sangsari learned more about the political issues that dentists and dental students face, which include staggering student debt after dental school, pro bono dental care, professional licensure and water fluoridation. Addressing the growing problem of student loan debt is a major issue for the American Student Dental Association, which Adrien is also a member of. Many recent dental school graduates are shying away from pursuing postgraduate training or a career in dental education due to the debt burden, which could adversely impact the number of specialists, teachers and researchers. In addition, Hamedi-Sangsari believes that government funding should be increased for pro bono dental care. He also feels that dental licensure needs to be a standardized nationwide exam, versus state-by-state and that the exam should eliminate live patients due to the number of variables involved. Hamedi-Sangsari also supports changing how dental students are evaluated from one day of assessment to reviewing a student’s entire case portfolio, because it's a better gauge of ability. Water fluoridation is another hot topic on Hamedi-Sangsari’s radar. He believes that water fluoridation should be mandatory in every major city, and that education is a major reason why dental cavities are still a problem for pediatric patients. Hamedi-Sangsari said that if dentists and dental students don’t advocate for these issues that affect their future and the patients they treat, who else would? Hamedia-Sangsari heard about the award from a faculty mentor and thought he had a good chance to be selected for the honor. He has been president of the UCLA Student Research Group and last year, before even officially becoming president of the group, Hamedi-Sangsari encouraged UCLA students to write and email letters to and call politicians about the issues dentists and dental students face. He also participated in the 2013 American Association of Dental Research/American Dental Education Association Advocacy Day on Capitol Hill. He spent the majority of his time advocating for Congress to maintain funding for the National Institutes of Health and the National Institute for Dental and Craniofacial Research and funding for primary care training in general dentistry, pediatric and public health dentistry. In August, Hamedi-Sangsari took the initiative and met with members of the California congressional delegation, including Henry Waxman, Karen Bass and Brad Sherman. During these meetings he discussed the groundbreaking research at UCLA and the importance of increasing funding for biomedical research. 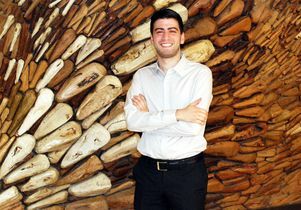 As he moves into his fourth year of dental school, Hamedi-Sangsari is starting to plan for life after UCLA. He said that he is leaning toward pursuing advanced training in orthodontics, and would like to work with adolescents in Southern California. Also, as a native of the San Fernando Valley, he would like to remain close to home. And of course, he plans to continue to advocate for the dental profession.